Bilqis Abdul-Qaadir, seen in a photograph for the NCAA Champion Magazine last year, was the first Muslim woman in a headscarf to play NCAA Division I basketball. Bilqis Abdul-Qaadir banded with other athletes to pressure the International Basketball Federation to change its ban on religious head coverings. Bilqis Abdul-Qaadir runs a basketball clinic for girls at the Islamic Society of North America Convention in Chicago in 2017. Bilqis Abdul-Qaadir was on her game. She played basketball for the University of Memphis in Tennessee and, as a high schooler in Massachusetts, set the state record for the highest all-time high school scorer for men and women — a record she still holds. Abdul-Qaadir, now 24, was also the first Muslim woman in a headscarf to play NCAA Division I basketball. She is part of a new generation of Muslims who are loud and proud about their faith even in the midst of rising anti-Muslim hostility. But wearing a hijab would later block her from her ultimate dream — going pro. In 2009, President Barack Obama praised her at a White House Ramadan dinner. "As an honor student, as an athlete on her way to Memphis," Obama said, "Bilqis is an inspiration not simply to Muslim girls — she's an inspiration to all of us." 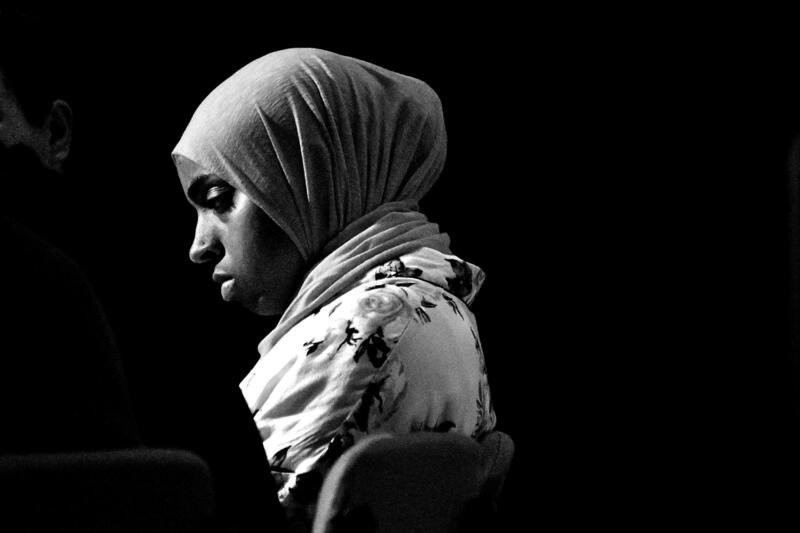 In college, she walked onto courts across the country with her hijab on. Not all the attention was positive. "I would walk in the gym and people would look at me all crazy from the stands," she said. "There would be times when I would be shooting a free throw and it would be dead silent and somebody would yell out: 'She's wrapped in a king-size sheet' or 'look at that rag on her head.' "
She said it hurt, "but through my play, I would shut them up. It's like 'OK, I'm dressed in this, but I'm killing your team.' "
She has never been the type to cower. Not even as a kid, when she shunned Barbies and nail polish for basketball with the boys. 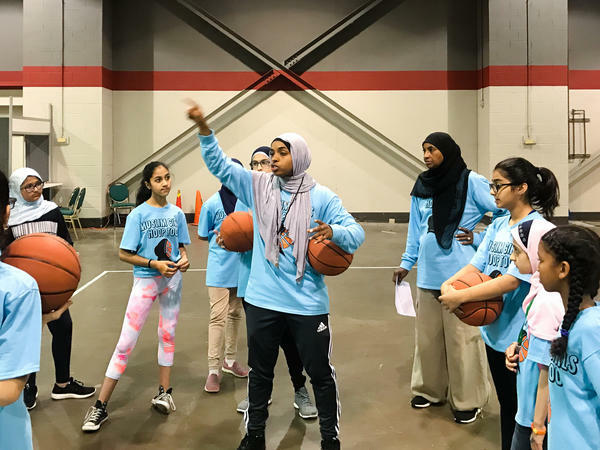 "I got judged a lot, even from Muslim communities that didn't think girls should be playing rough, or playing in front of men, you know those stereotypes," she said. "But that's not what our religion teaches. God blessed me with the talent, why not use it?" After college, she had an opportunity to play professionally in Europe. But the International Basketball Federation, known as FIBA, banned religious head coverings. "I had to choose between my faith and the sport that I love. And I questioned wearing my scarf," she said. "I questioned being Muslim at the time." Ultimately, she chose her religion. She also chose to fight, banding with other athletes who wear religious head coverings to pressure FIBA through petitions and social media campaigns to change the rule. Last year, they won that battle. Now all religious head coverings from the turban worn by Sikhs to the yarmulke to the hijab are allowed on the basketball court. But it was too late for her to go pro. Abdul-Qaadir is now using her skills to teach the next generation how to play. 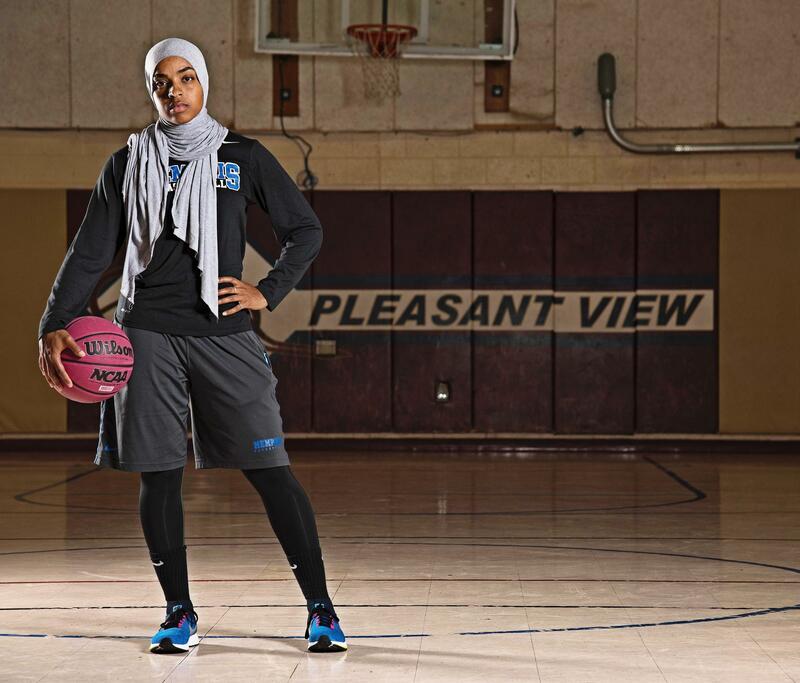 She started the online campaign "Muslim Girls Hoop Too," is a motivational speaker and runs basketball clinics. That was what she was doing when we meet, running a clinic for young Muslim girls in Chicago. She doesn't want the girls she is coaching to "go through what I went through," she says. "To put your life on hold or to put your career on hold, or your opportunities, because we're different or because people think we don't fit the norm." Other Muslim women are also emerging on courts, fields and even boxing rings. Last year, teenage Muslim amateur boxer Amaiya Zafar of Oakdale, Minn., won a two-year fight to get a waiver so she could wear her hijab while boxing. And recently, Olympian fencer Ibtihaj Muhammad had a Barbie fashioned after her — the first with a head covering. Muhammad was the first Muslim American who wears hijab to compete for the U.S. Olympic team. Back at the clinic, Medina Skenderi of Illinois helps Abdul-Qaadir wrangle the girls, including her little sister. Skenderi, 19, discovered Abdul-Qaadir when she Googled sports hijabs online. She's a soccer player. "You don't see a lot of people with hijabs playing sports," she said. "She's pretty awesome." Abdul-Qaadir says that even though basketball is "just a sport," her fight has a larger resonance. "I want people to understand that we belong in every space whether it's on the court, whether it's in a hospital, whether it's in a courtroom, we belong regardless," she says. "I feel like when we break these barriers, we represent Muslim women all over."